Former interim UFC welterweight champion Colby Covington takes a shot at Kelvin Gastelum ahead of his middleweight title bout against Robert Whittaker at UFC 234. 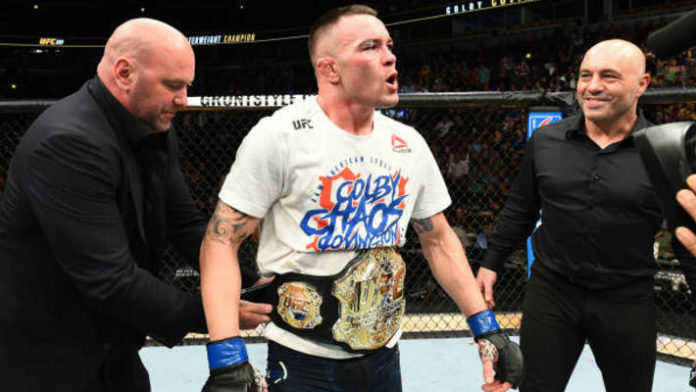 Colby Covington doesn’t reserve his trash talk just for those fighting in his own weight class at 170 pounds. “Chaos” has a history of taking shots at fighters of all divisions, including middleweight. Recently, Covington took to Twitter and fired off a shot at UFC middleweight title challenger Kelvin Gastelum. He posted several photos of Gastelum, pointing out blemishes on his skin. Gastelum is preparing to co-main event UFC 234 on pay-per-view (PPV) tomorrow night (Sat. February 9, 2019). The show goes down from the Rod Laver Arena in Melbourne, Australia. The former Ultimate Fighter winner challenges Robert Whittaker for the 185-pound throne. Whittaker hasn’t lost a fight in nine-straight contests. However, this will be Whittaker’s first career title defense if he and Gastelum both make weight. In Whittaker’s last scheduled contest, opponent Yoel Romero failed to make championship weight. As a result, their fight was simply a five-round main event. As for Covington, he’s currently at odds with the UFC over a welterweight title opportunity. “Chaos” has gone as far as saying he might have already fought for the last time in his career. What do you think about Covington taking a shot at Gastelum ahead of UFC 234?